This is part of a weekly reading group on Nick Bostrom&apos;s book, Superintelligence. For more information about the group, see the announcement post. For the schedule of future topics, see MIRI&apos;s reading guide. Welcome to the Superintelligence reading group. This week we discuss the first section in the reading guide, Past developments and present capabilities. This section considers the behavior of the economy over very long time scales, and the recent history of artificial intelligence (henceforth, &apos;AI&apos;). These two areas are excellent background if you want to think about large economic transitions caused by AI. This post summarizes the section, and offers a few relevant notes, thoughts, and ideas for further investigation. My own thoughts and questions for discussion are in the comments. There is no need to proceed in order through this post. Feel free to jump straight to the discussion. Where applicable, page numbers indicate the rough part of the chapter that is most related (not necessarily that the chapter is being cited for the specific claim). This makes it more plausible that human-level AI will arrive and produce unprecedented levels of economic productivity. Thus economic history suggests that rapid growth caused by AI is more plausible than you might otherwise think. In case you are too curious about what the topic of this book is to wait until week 3, a &apos;superintelligence&apos; will soon be described as &apos;any intellect that greatly exceeds the cognitive performance of humans in virtually all domains of interest&apos;. Vagueness in this definition will be cleared up later. In particular, how does &apos;AI&apos; differ from other computer software? The line is blurry, but basically AI research seeks to replicate the useful &apos;cognitive&apos; functions of human brains (&apos;cognitive&apos; is perhaps unclear, but for instance it doesn&apos;t have to be squishy or prevent your head from imploding). Sometimes AI research tries to copy the methods used by human brains. Other times it tries to carry out the same broad functions as a human brain, perhaps better than a human brain. Russell and Norvig (p2) divide prevailing definitions of AI into four categories: &apos;thinking humanly&apos;, &apos;thinking rationally&apos;, &apos;acting humanly&apos; and &apos;acting rationally&apos;. For our purposes however, the distinction is probably not too important. We are going to talk about &apos;human-level&apos; AI a lot, so it would be good to be clear on what that is. Unfortunately the term is used in various ways, and often ambiguously. So we probably can&apos;t be that clear on it, but let us at least be clear on how the term is unclear. One big ambiguity is whether you are talking about a machine that can carry out tasks as well as a human at any price, or a machine that can carry out tasks as well as a human at the price of a human. These are quite different, especially in their immediate social implications. Other ambiguities arise in how &apos;levels&apos; are measured. If AI systems were to replace almost all humans in the economy, but only because they are so much cheaper - though they often do a lower quality job - are they human level? What exactly does the AI need to be human-level at? Anything you can be paid for? Anything a human is good for? Just mental tasks? Even mental tasks like daydreaming? Which or how many humans does the AI need to be the same level as? Note that in a sense most humans have been replaced in their jobs before (almost everyone used to work in farming), so if you use that metric for human-level AI, it was reached long ago, and perhaps farm machinery is human-level AI. This is probably not what we want to point at. Another thing to be aware of is the diversity of mental skills. 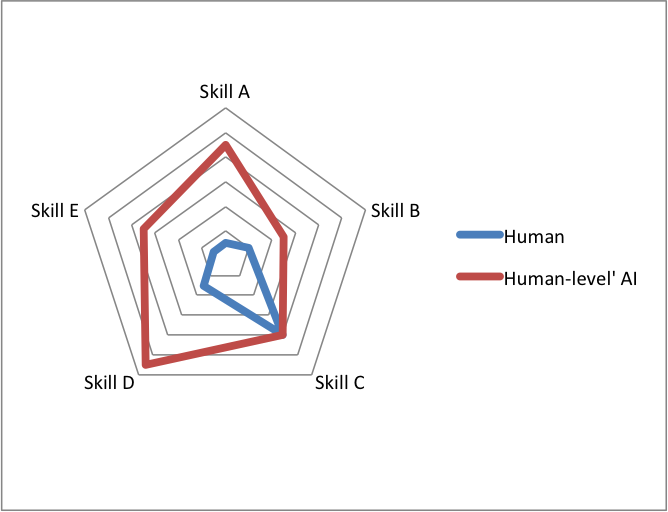 If by &apos;human-level&apos; we mean a machine that is at least as good as a human at each of these skills, then in practice the first &apos;human-level&apos; machine will be much better than a human on many of those skills. It may not seem &apos;human-level&apos; so much as &apos;very super-human&apos;. We could instead think of human-level as closer to &apos;competitive with a human&apos; - where the machine has some super-human talents and lacks some skills humans have. This is not usually used, I think because it is hard to define in a meaningful way. There are already machines for which a company is willing to pay more than a human: in this sense a microscope might be &apos;super-human&apos;. There is no reason for a machine which is equal in value to a human to have the traits we are interested in talking about here, such as agency, superior cognitive abilities or the tendency to drive humans out of work and shape the future. Thus we talk about AI which is at least as good as a human, but you should beware that the predictions made about such an entity may apply before the entity is technically &apos;human-level&apos;. Example of how the first &apos;human-level&apos; AI may surpass humans in many ways. Because of these ambiguities, AI researchers are sometimes hesitant to use the term. e.g. in these interviews. Robin Hanson wrote the seminal paper on this issue. Here&apos;s a figure from it, showing the step changes in growth rates. Note that both axes are logarithmic. Note also that the changes between modes don&apos;t happen overnight. According to Robin&apos;s model, we are still transitioning into the industrial era (p10 in his paper). One might be happier making predictions about future growth mode changes if one had a unifying explanation for the previous changes. As far as I know, we have no good idea of what was so special about those two periods. There are many suggested causes of the industrial revolution, but nothing uncontroversially stands out as &apos;twice in history&apos; level of special. You might think the small number of datapoints would make this puzzle too hard. Remember however that there are quite a lot of negative datapoints - you need an explanation that didn&apos;t happen at all of the other times in history. It is also interesting to compare world economic growth to the total size of the world economy. For the last few thousand years, the economy seems to have grown faster more or less in proportion to it&apos;s size (see figure below). Extrapolating such a trend would lead to an infinite economy in finite time. In fact for the thousand years until 1950 such extrapolation would place an infinite economy in the late 20th Century! The time since 1950 has been strange apparently. You can see them in action: SHRDLU, Shakey, General Problem Solver (not quite in action), ELIZA. Algorithmically generated Beethoven, algorithmic generation of patentable inventions, artificial comedy (requires download). Here is a neural network doing image recognition. Here is artificial evolution of jumping and of toy cars. Here is a face detection demo that can tell you your attractiveness (apparently not reliably), happiness, age, gender, and which celebrity it mistakes you for. Bostrom points out that many types of artificial neural network can be viewed as classifiers that perform &apos;maximum likelihood estimation&apos;. If you haven&apos;t come across this term before, the idea is to find the situation that would make your observations most probable. For instance, suppose a person writes to you and tells you that you have won a car. The situation that would have made this scenario most probable is the one where you have won a car, since in that case you are almost guaranteed to be told about it. Note that this doesn&apos;t imply that you should think you won a car, if someone tells you that. Being the target of a spam email might only give you a low probability of being told that you have won a car (a spam email may instead advise you of products, or tell you that you have won a boat), but spam emails are so much more common than actually winning cars that most of the time if you get such an email, you will not have won a car. If you would like a better intuition for maximum likelihood estimation, Wolfram Alpha has several demonstrations (requires free download). The second large class of algorithms Bostrom mentions are hill climbing algorithms. The idea here is fairly straightforward, but if you would like a better basic intuition for what hill climbing looks like, Wolfram Alpha has a demonstration to play with (requires free download). How have investments into AI changed over time? Here&apos;s a start, estimating the size of the field. What does progress in AI look like in more detail? What can we infer from it? I wrote about algorithmic improvement curves before. If you are interested in plausible next steps here, ask me. What do economic models tell us about the consequences of human-level AI? Here is some such thinking; Eliezer Yudkowsky has written at length about his request for more. Next week, we will talk about what AI researchers think about human-level AI: when it will arrive, what it will be like, and what the consequences will be. To prepare, read Opinions about the future of machine intelligence from Chapter 1 and also When Will AI Be Created? by Luke Muehlhauser. The discussion will go live at 6pm Pacific time next Monday 22 September. Sign up to be notified here.